Jonny Leota scored a late bonus-point try as Sale Sharks set up a decider against Newport for a place in the European Challenge Cup quarter-finals. An early score by Andrei Ostrikov was added to by tries from Nev Edwards and Will Addison before the break. The Premiership side only secured their bonus point when Samoa centre Leota crossed out wide with a minute to go. 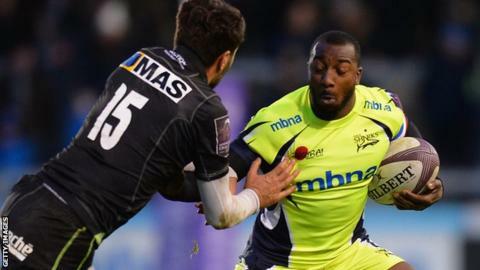 Sale sit second in the group, two points behind leaders Newport, who beat Castres on Friday. Josh Beaumont captained the side in the week he received his first England call-up as the Sharks won for a second time in France this season. Steve Diamond's side will fancy their chances against their Welsh opponents next week, as they are unbeaten at the AJ Bell Stadium since April 2015. Pau: Malie; Vunibaka, Fumat (capt), Dupouy, Acebes; Fajardo, Marques; Moise, Bianchin, Natsharashvili, Pierce, Dry, Habel-Kuffner, Domolailai, Monzeglio. Replacements: Boundjema, Jacquot, Orlandi, Dougall, Bernad, Lacrampe, Buros, Votu. Sale: Haley; Arscott, Addison, Leota, Edwards; Cipriani, Cusiter; Harrison, Taylor, V Cobilas, Evans, Ostrikov, Neild, Lund, Beaumont (capt). Replacements: Briggs, Flynn, Parker, Mills, Easter, Mitchell, Ford, Jennings.